Directing 2008’s “In Bruges”, Martin McDonagh made quite the debut behind the film camera. As an audience, we’ve had to wait four years for his follow-up, but it was worth it….I think. 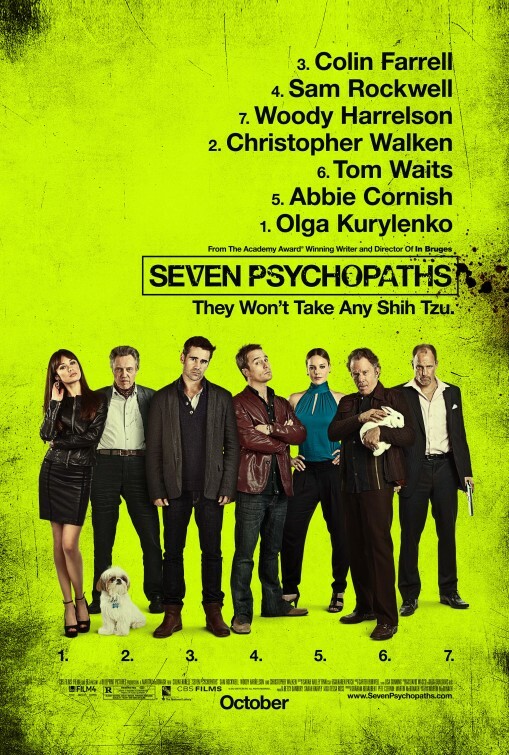 The follow-up is 2012’s “Seven Psychopaths”, a truly odd, truly entertaining flick that defies just about any description I can come up with. Working in Los Angeles, Marty (Colin Farrell) is struggling to complete his screenplay for a film he calls ‘Seven Psychopaths.’ His biggest issue is coming up with the actual psychopaths for which he has actually one. As he tries to come up with the characters, Marty gets mixed up with a predicament his friend, Billy Bickle (Sam Rockwell), has fallen into. 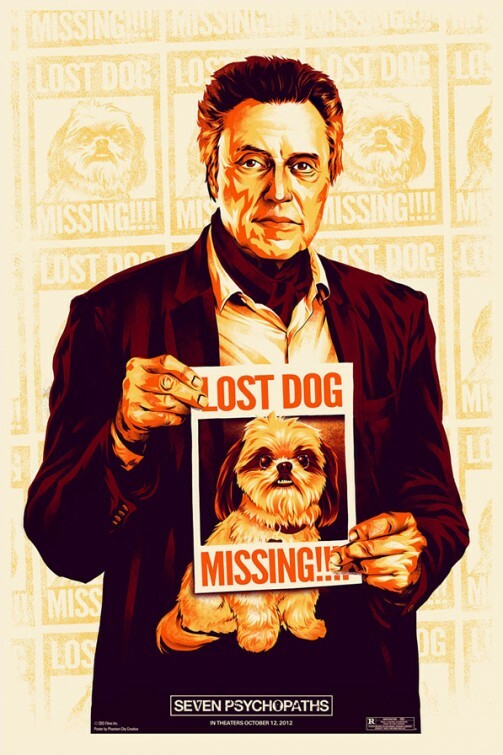 With his highly religious partner, Hans (Christopher Walken), Billy kidnaps dogs and then has Hans return them to their owners for the reward. Billy’s picked the wrong target this time though, stealing a dog named Bonny from its owner, Charlie (Woody Harrelson), who just happens to be a real-life psychopath and rather unpredictable gangster. Right in the mix of it all, Marty may have found all the inspiration he’ll need for his screenplay….if he can survive that is. I loved “In Bruges” when I first saw it, and I loved it even more on follow-up viewings. So when I saw McDonagh was directing a similarly themed ultra-dark, ultra-violent flick, I was psyched. Several days since watching the movie, I can say I did like it even though I’m still processing it. I watch some movies, and I know exactly what I want to say. Then there are movies like this where any description doesn’t seem perfectly appropriate. It bounces among countless different descriptions from dark humor to gut-wrenching drama to graphic violence to a buddy flick. Somewhere among all those at-times appropriate descriptions is a really good movie. Putting those all together into a non-rambling review? Well, let’s see what I can come up with. McDonagh deserves a lot of credit for this one. Bringing all these seemingly disparate things together with the cast he’s assembled could cripple many directors. And while there are times the movie seems to have lost its way, it always rights the ship. It is about Marty and his struggles. It is about Billy and Hans’ dog kidnapping operation. It is about Charlie’s hunt for his dog. At the same time, it’s more than that. We meet plenty of other characters in a variety of storytelling techniques. We also hear about the Jack of Diamonds killer who may or may not be involved with the kidnappings. We also delve into Marty’s screenplay, meeting two of his psychopaths, a Quaker father (Harry Dean Stanton) seeking revenge for his daughter’s murder and a former Vietcong soldier turned priest (Long Nguyen) planning an ultimate revenge. These asides come through Marty’s narration, and they’re great. This ability to craft such a stylish, twisting and turning story is a testament to McDonagh’s ability. It is a script that weaves among all these stories, flashbacks and what-ifs, never staying in one place too long or settling. The weird thing is; all those asides are both real and fake. The Quaker father actually has a very real connection to Marty, Billy and Hans’ story. The Jack of Diamonds killer similarly has a connection, and the Vietnamese priest becomes real as Hans tries to come up with a suitable ending for a story that Marty is struggling to come up with. At one point, Billy — desperately trying to help Marty finish his screenplay — comes up with a ridiculously over the top action finale sequence full of explosions, dismemberments, and action clichés that a 1980s movie would appreciate. The what-if sequence blends all the characters we’ve met — real, fake and written in a script — in an inspired sequence that stands out from the rest of an already very enjoyable movie. What stood out for me most was the buddy aspect that works so well in ‘Psychopaths.’ It’s reminiscent of the relationship between Farrell and Brendan Gleason in McDonagh’s In Bruges. Marty, Billy and Hans are three very different people but there’s an odd friendship that just works among them. Marty is a worrier, especially about his screenplay and girlfriend (Abbie Cornish), Billy wants to help him out wherever and whenever possible, and Hans is looking out for wife (Linda Bright Clay) fighting through cancer treatments. 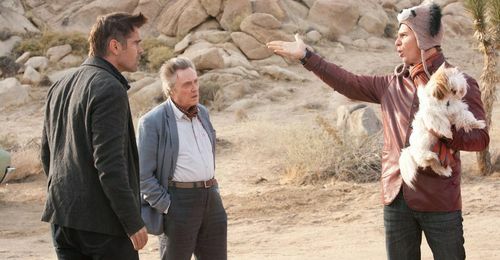 Much of the second half of the movie is the trio sitting around a campfire in the desert talking, coming up with ideas for the screenplay, busting each other’s balls, smoking peyote and drinking. Directing and writing the script, McDonagh has a knack and talent for creating believable, funny and even emotional relationships among male friends. I loved the scenes with these three amidst all the chaos around them, bringing the movie down to a more personal level. The rest of the cast is similarly spot-on. Replacing Mickey Rourke (who dropped out during filming), Harrelson is perfectly nuts as Charlie. We don’t know why he’s nuts. He just simply is….NUTS. Tom Waits is a scene-stealer as Zachariah, a potential psychopath for Marty with quite the checkered past. The image alone of a weathered Waits sitting on Billy’s doorstep petting a white rabbit is surreal and perfect. His phone call with Marty is surprisingly funny too in an effective emotional scene. Also look for Michael Stuhlbarg and Michael Pitt (great in the opening scene), Olga Kurylenko, Kevin Corrigan, Gabourey Sidobe, and Zeljko Ivanek as Paulo, Charie’s enforcer. A weird, weird movie, but one I liked. It’s a flick that is really all over the place and would probably benefit from a repeat viewing. For now though, I’ll still give it a high rating. Beware of some at-times shocking violence to go with a truly dark sense of humor. Probably not for everyone, but still highly recommended. Good review. This movie was great and kept me watching the whole time. I didn’t feel much for these characters; as much as I felt for the ones in In Bruges, but I still had a fun time listening to everybody speak this snappy dialogue out. Glad you liked it, CMrok93! I agree about the characters, I felt more for Farrell and Gleason in In Bruges than I did the characters in Seven Psychopaths. I think I probably liked Rockwell the best here, even as dark as things get.